Why choose a wrought iron door for your home? A Signature wrought iron door increases the aesthetic beauty of your home, endures weather and time, and assists to secure your home and family. 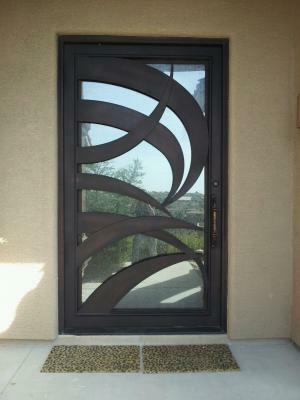 Signature Iron Doors offers a wide array of designs and welcomes the opportunity to custom build. This is a custom built door for a family in East Mesa Arizona. They wanted a more contemporary door and worked with our designers to come up with this finished product. No matter your taste, Signature Iron Doors will provide the perfect door for you. Call us and come visit our showroom in Phoenix Arizona to meet with a sales representative to find out how you can receive a Signature Wrought Iron Entry Door for your home.